Paul Deighton, CEO, London Olympic Games Organising Committee (LOGOC) speaks at City University London. Students, media, academics, local community members and industry were treated to a unique insight into the organisation of the London 2012 Olympics during a guest lecture from Paul Deighton, CEO, LOGOC at City University London on Thursday 17 March 2011. Speaking on a range of topics, including the logistics of bringing the Games together, the construction of Olympic venues and the task of mobilising a quarter of a million stakeholders involved in delivering the Games, Mr Deighton said the focus at the moment is motivating the public to buy tickets. "We are on track in terms of acquiring sponsorship for the event and constructing the venues, but to ensure the event remains financially viable we are now turning our attention to selling the 8.8 million tickets available across all events. "With less than 500 days to go, the clock is now ticking and that's part of the reason why I'm here tonight," said Mr Deighton. The talk was delivered as part of the University's World City Week - a celebration of the international community at City. Fitting in with this theme, Deighton highlighted the potential of the Olympics to showcase London as a key international city. "It will effectively be our biggest tourism campaign ever. We will be sending a digital postcard showcasing London to the world." Deighton also spoke about his team's focus on delivering the original dream for the Olympics of inspiring young people around the world. "Our bid was based on a promise of using the event to inspire young people across the world to get involved in sport, but a lot of our focus has also been on the legacy we will leave for London. 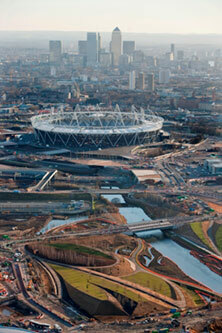 The project has resulted in a significant regeneration of East London, which will benefit generations to come."